Tags Posts tagged with "s.w.e.a.t." A local fitness competitor turned author and fitness studio owner shares the inspiration behind opening her new Mason-based gym. Read on for all the inspiring details. Linda Mitchell (purple) of The Chickfit Studio, which aims to help women build self-confidence and find their healthiest selves. If you ask Linda Mitchell what the one thing is that women struggle with the most, she’ll say that it’s taking time for themselves. She says that it’s about realizing that you, as a woman, are worth the time it takes to ensure that you are caring for yourself. “It isn’t selfish, it’s self-care,” says Mitchell. “If you don’t believe you’re worth it, you won’t take the time to invest in yourself. What I think it really boils down to is realizing that you are worth taking time for and that it is important to take time for yourself and make yourself a priority, and it’s OK to make yourself a priority. And Mitchell is more than qualified to help women reach that point of empowerment. As an Institute of Integrative Nutrition graduate and an award-winning fitness competitor, Mitchell is also the author of The Sisterhood of S.W.E.A.T. (Strong Women Empowering Achieving Together). Mitchell was inspired to open The Chickfit Studio after she found that deep down in her heart she wanted to do something that was worthwhile and made real, lasting changes in people’s lives. Mitchell says that what makes her book the most unique is that it isn’t just another run of the mill gym book dictating people on what to eat. “It’s about how we really feel from the inside out and how we can support and love one another to all achieve rather than compete with each other,” she adds. Her book became an outlet for Mitchell to bring women together and make it a community in which we can build each other up. “The focus of The Chickfit Studio is to be gentle, be kind, and love on one another. 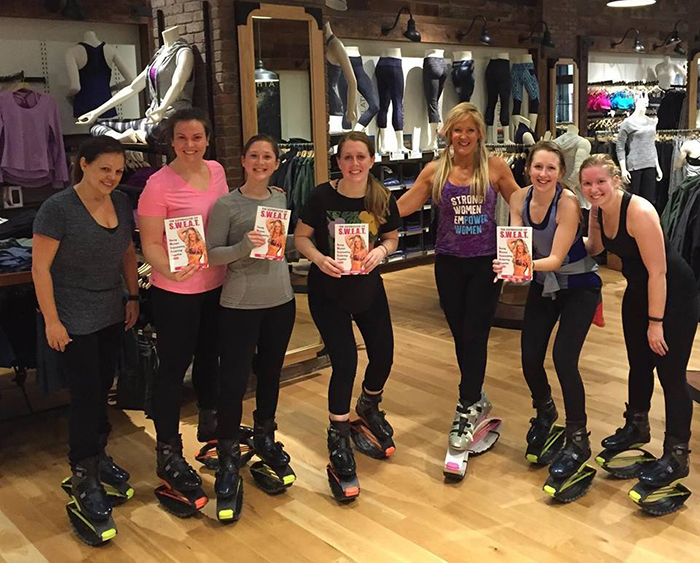 Chickfit is all about building each other up with encouragement and support,” she says. Mitchell also wants to help women who want to get back into being fit and healthy. Classes available at The Chickfit Studio include group classes like First S.W.E.A.T. Chickcamp Bootcamp, Chick-Boxing, TRX Suspension training, running coaching, hot yoga, and Kangaroo Kardio in Kangoo Jumps. They also offer one-on-one sessions or small group sessions. There are also health coaches available for your nutrition needs. You can find The Chickfit Studio at 115 B Reading Road in Mason. Learn more at www.chickfit.me or purchase a copy of The Sisterhood of S.W.E.A.T. here.